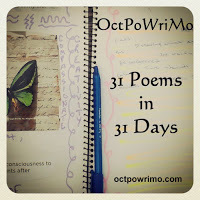 Today's poem for #OctPoWriMo is a very emotional one. Initially I wasn't going to go this direction with the prompts, but it came to me very suddenly. So I wrote. And quite possibly, I even shed a tear while writing. For those of you who know me, you know of the loss my wife and I suffered almost 15 years ago. Today's poem, guided by the prompts of perfection and imperfection, speaks to that loss. it all happened too quick, too early. a glimpse of Heaven for a time. (with help from his doctors). He fought, but lost the battle. He tried, and won the war. So, so sorry for your loss! Thank you for sharing this poem. Such sadness and fragility expressed here. My heart aches for you and yours. "Michael was born imperfect (we all are)"
That line really struck me...so true and well-put.